Many people still have the image in their minds that those who run hemp companies are neo-Luddites, and that the farmers who supply them with their raw materials sow the seed by hand on small plots and harvest the grain or fiber with horse-drawn equipment. This may come to pass again in the future, but for now farmers, manufacturers, distributors and consumers are all part of a complex and modern system. I also work for a company that distributes all kinds of industrial supply parts from companies such as Grainger, John Deere, McMaster-Carr, Motion Industries, MSC and Timken. It often strikes me that the hemp industry is also part of this massive supply chain. We are far from being part of the "counterculture." As The Oregonian story on Living Harvest shows, we are indeed becoming more a part of the mainstream every day. Traditional industries in the U.S. and around the world are embracing the benefits of using hemp in their products. I was reminded of this again earlier this week when Reuters reported that visitors at the British International Motorshow in London viewed a prototype of the Lotus Eco Elise which is made with the equivalent of 1,700 recycled aluminum cans and with hemp grown locally in Norfolk (comprising 25% of the car). It also has solar panels on the roof to help power its electrical system. While the car is not a high-torque electric tractor running off solar panels and farming local, organic, sustainable crops, it does push the envelope of industrial design. That in turn helps get us closer to that future by educating the media and the public about what is truly possible and attainable. As wonderful as it is to imagine and work towards a future where industrial hemp is grown locally to meet our needs for food, clothing, shelter and transportation, reality does have a way of rearing its ugly head when you least expect it. Anna Korakaki found this out in Athens, Greece last week in a nightmarish scene where she was arrested for receiving 4.5 kilos of hemp protein powder at her local post office and was then forced to spend the night in a jail cell. All this because she was creating superfood recipes for her new natural foods company. We have come a long way in the last fifteen years through educating farmers, legislators, the media, businesses and consumers, but it is obvious that we still have a long way to go, and we need your help to do it. On Wednesday morning July 16th, Anna Korakaki went to her local post office in Athens, Greece to pick up her latest health product order from Navitas Naturals, a health food company based in the USA. Anna had previously received shipments from Navitas which included raw cacao from Ecuador, maca from Peru, goji berries from Tibet, and other high-quality nutritious foods. Moments after accepting her package Anna was immediately intercepted by 4 police officers, thrown on the hood of a police car and brutally handcuffed. Police then ransacked her apartment and after finding nothing suspicious or illegal, took Anna to a police station for further interrogation. Anna was then forced to spend the night in an Athens jail cell. The reason for Anna Korakaki's arrest was that she had received 4.5 kilos of hemp protein (a 'super-food' made from powdered hemp seeds), which she had ordered for the express purpose of making healthy smoothies. The order had a value of 57 Euros (US$89), and represented but one of hundreds of hemp products available worldwide in health food stores, super-markets and via the Internet. Hemp products are commonly found in health-food stores and supermarkets in the USA, Canada and Europe including Greece. Hemp is sold as a whole seed, a powder, as nut butter, as oil and salad dressings, and is sprouted for inclusion in healthy breads. Hemp is also used to make organic breakfast cereals, and is increasingly popular as a non-dairy milk (similar to rice, soy and almond milks), and as a non-dairy ice cream. Hemp is the highest source of essential fatty acids in the plant kingdom. Of the three million plus edible plants that grow on Earth, no other single plant source can compare with the nutritional value of hemp seeds. Both the complete protein and the essential oils contained in hemp seeds are in ideal ratios for human nutrition. Hemp protein contains all 21 known amino acids, including the 8 essential amino acids that adult bodies are unable to produce. It is rich in vitamin E, iron, and contains 33% protein. This means that per serving, hemp contains more protein than meat, fish, chicken and cheese. Unfortunately, paranoia from the so-called 'War on Drugs' has sometimes implicated non-psychoactive industrial hemp varieties of cannabis with psychoactive marijuana varieties. The Greek court system, for instance, finds it difficult to define the difference between hemp food and marijuana. Tests of the Navitas Hemp Protein Powder by chemists at Greek Customs claim to have located trace particles of THC. According to Greek law this renders the hemp protein Anna received as an equivalent to marijuana. This has lead to Anna being charged with four criminal counts of drug possession. As a result, Anna could face prison if the court system cannot be convinced that the hemp food that she received is a valid, and universally legal, form of nutrition. According to Oprah Winfrey-consultant and best selling author Dr. Andrew Weil: "There is absolutely no health concern about trace amounts of THC in hemp foods." It is well established that the seeds harvested from industrial hemp Cannabis Sativa, such as are grown in Canada and throughout the EU can contain low levels of THC. These levels are typically in the parts per million (ppm). In the USA, hemp foods are legal to sell and there is currently no legal limit on the THC content. In Canada and Europe regulations limit the concentration of THC in hemp seed oil and other food products to less than 10 parts per million. The hemp protein that Anna Korakaki ordered is made from 100% ground hemp seed, grown and processed in Canada by Hemp Oil Canada Inc. and distributed by Navitas Naturals in the USA. In a statement from Hemp Oil Canada Inc. its president Shaun Crew writes, "From the seed harvested, we are regulated to produce products which must contain less than 10 ppm (as the Canadian legal limit). According to the official Health Canada testing protocol for THC, the limit of detection is 4 ppm. So any analysis result falling under 4 ppm is reported as none detected. We are pleased to report that not a single analysis of our products has ever produced a result over 4 ppm and therefore it is stated and reported as none detected." Because of this fact and that the nutritional information listed for the product declared no THC levels, Anna felt certain that hemp protein was legal in Greece. The day of Anna Korakaki's arrest, her friends went to a local health food store in Athens to purchase a loaf of sprouted hemp bread (meaning that whole hemp seeds had been imported to Greece, then sprouted and ground for baking). The bread was brought before the judge to demonstrate that hemp foods are available in Greece, which seemed to shock the judge, but made no difference to his thinking towards Anna's parole. Anna is now required to go to her local police station once per month, identify her self and register by signature, until such time as her decisive day in court which, given the typical speed with which Greek justice is served, could be as much as two years away. It stands to reason that even if someone were to eat an entire 4.5 kilo bag of hemp protein, they would not experience any effects, or an altered state of consciousness, from the THC, perhaps just a bloated stomach. Anna's story is so amazing in its absurdity that all the media in Greece are following it. Anna Korakaki is the co-founder of Super Foods Greece, a company that provides educational seminars and super-foods in Greece. 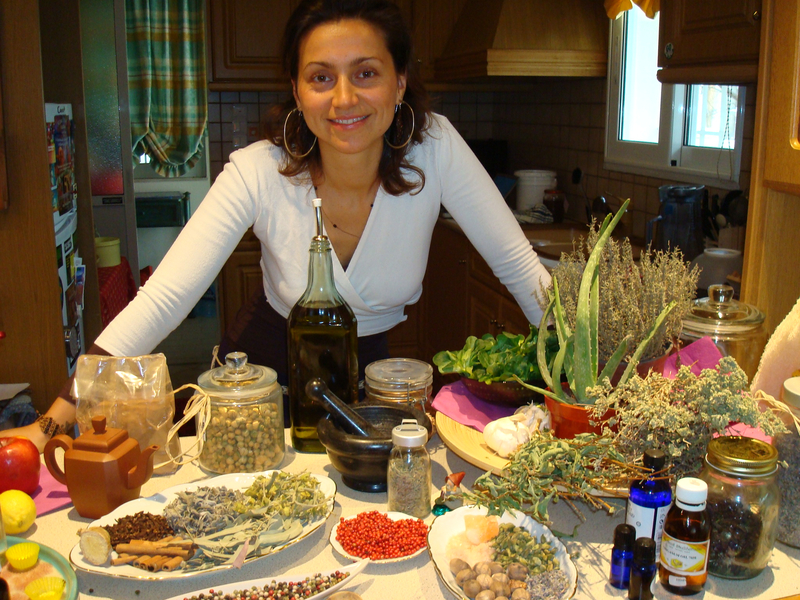 She introduced raw food nutrition and super-foods to the nation of Greece. Anna travels the world educating people on nutrition and advising them on nutritional cleansing and natural healing, specializing in deep detoxification and cellular rejuvenation. She is a certified massage therapist and certified yoga instructor. If you think that hemp is going to be grown again in the U.S on pre-1937 terms you are dreaming. Please check out these Quick Links Concerning the Canadian Industrial Hemp Industry. They are pretty complicated, yes? Stakeholders in Canada are working on making them less so, but that's what it took to get hemp grown there in the first place. They compromised, primarily with the law enforcement lobby, got regulations in place and have had hemp in the ground for over a decade. Whatever form industrial hemp regulations take is because of existing laws, regulations and treaties that exist in a post-1937 world. A lot of these exist because of our good friend Harry Anslinger. I'd love it if we could ignore all pre-existing laws and the history of all of this, especially since most of the laws, regulations and treaties were written without the clear scientific understanding of the chemical and biological difference between the varieties of Cannabis, and just start from scratch based on what we know now. The law enforcement lobby is never going to let this happen. In my opinion law enforcement should not have the power to lobby. Legislators should decide on issues and write and pass laws and law enforcement should enforce them. It would be wonderful if I could go down to my local feed and farm store, buy a 50 lb. sack of certified oilseed hemp like Finola, 'till up the acre out in front of my house, plant the seed, grow it, harvest it, thresh it and store it to feed to my chickens — all without any government regulations or oversight. But, all that is wishful thinking because it's never going to happen. The simple truth is that we, just like the Canadians before us, will need to compromise and get reasonable regulations in place if we want to get hemp grown again in the U.S. I'm not going to argue these points with you anymore since it seems pointless. I will put my energy elsewhere. Election year politics are especially hard on hemp farming and study bill legislation. Minnesota had a hemp farming bill introduced in March of 2007 which was carried over to 2008, the second part of their two-year session. The bill was well-received and passed in two committees, but it was stuck in a third committee when the House adjourned, thus killing it. An agriculture committee omnibus bill was introduced in the Minnesota House earlier this year that passed and included a section on "Industrial Hemp Development and Regulation." There was also a companion bill that passed in the Senate, but without the hemp language. The related section from the House bill was added to the Senate bill in conference committee, but was then removed at the insistence of the State Patrol and Governor Pawlenty's Washington, DC lobbyist. The omnibus bill was ultimately signed by the Governor, but without any hemp language. We hope that the popular hemp farming bill in Vermont (H.267) does not suffer a similar fate. The bill passed the House in February by a vote of 126 to 9, and then passed the Senate by a vote of 25 to 1 earlier this month. We are awaiting word on when H.267 will be sent to Governor Douglas for his veto or signature. Unfortunately, the Governor's option to allow bills to become law without his signature was taken away this session when the Legislature adjourned without establishing a veto session. There are still plenty of things to do while we wait. You can register to vote and then click here to write your Representative in Congress and ask him or her to co-sponsor HR 1009, the Industrial Hemp Farming Act of 2007, which is currently stalled in committee. This being a presidential election year seems to accentuate the political nature of many things. Hemp remains in the position that it's in here in the United States not because of any difference of opinion based on facts, but because of politics. We started the legislative season this year with five bills carried over from last year, and because of election politics we did not expect any new legislation to be introduced. In The Hemp News Update earlier this year, I stated that we had high hopes for H.267, the hemp farming bill in Vermont. Late last week, after years of hard work by many people, politics very nearly killed the bill. Supporters of Vote Hemp and the agricultural policy non-profit Rural Vermont made sure that the bill moved out of committee and got the floor vote in the Vermont Senate that it deserved after passing in the House by a vote of 126 to 9. The Senate vote late last Thursday was 25 to 1! A lot of people seem to think that the legislative process is too arcane, that it's too hard to understand, and that they can't make a difference. They are wrong. You can and do make a difference! Vote Hemp and Rural Vermont sent out a series of Action Alerts last week asking supporters of the hemp farming bill in Vermont to call key Senators. Our featured story "Senate Passes Bill Legalizing Industrial Hemp Cultivation" and the Bennington Banner story "Hemp Bill Moves to Full Senate Vote" clearly confirm that focused action works. If you live in Vermont, the next step is to call Governor Douglas and write letters to the editor. (Vermonters only, please!) It is important as a "pocket-veto" is not an option for the Governor. Others can still register to vote and click here to write your Representative in Congress and ask him or her to co-sponsor HR 1009, the Industrial Hemp Farming Act of 2007, which is currently stalled in committee.